Millions of animals are killed every day on United States roads alone, providing ample evidence that roads are dangerous to wildlife. But if animals can only hear the traffic, is it still a threat? Yes, suggests a growing body of research looking at the impacts of anthropogenic noise on birds, frogs, fish, insects, prairie dogsand even organisms without ears. Though it rarely directly maims or kills, anthropogenic noise — including road noise — is increasingly being recognized as a form of habitat degradation and source of stress that interferes with animals’ health and well-being. “This research really took off about a decade ago,” explainsClinton Francis, assistant professor of biological sciences at Cal Poly State University. What’s becoming apparent, Francis says, is that animals respond to noise in many different ways, and scientists are just beginning to understand the ramifications. Some responses can be observed in changes in animal behavior and communication. Others show up in where animals choose to live, their success in fending off predators, or their ability to hunt — or in subtler impacts to mating, reproductive success andphysiological stress. Numerous experiments with birds and other species suggest that noise acts as an obstacle — something to be avoided — that can alter animals’ movements. 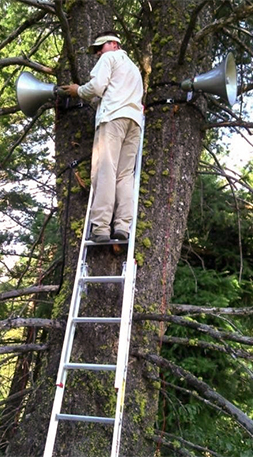 One striking experiment used recorded noise to create a “phantom road.” Decades of research have shown a reduction in density and diversity of species near roads but, says Fristrup, “the perceived view before this work is that noise was not considered to be a primary agent [of disturbance].” To test that assumption, researchers from Boise State University hung speakers on trees in a forested area in Idaho, broadcast the sounds of traffic recorded in Glacier National Park, and observed the impacts on migrating birds that included warblers, flycatchers, cedar waxwings, robins and mountain chickadees. “The surprising thing that emerged was that the same thing happened with no other factors” associated with roads, such as visual disturbance, collisions, habitat destruction or chemical pollution, says Fristrup, who helped with the study. With noise as the only disruption, the researchers found a more than one-quarter decline in bird abundance along the phantom road and almost complete avoidance by some species. Displacing birds from accustomed habitat is not the only significant impact noise can have on these acoustically attuned animals. A study conducted near a large airport showed that birds tended to avoid singing at noisy times. And that, Francis says, could be a problem. “If [male] birds are avoiding noise to be heard, they run the risk of dispatching a signal outside the time period when it could be heard by females or potential rivals,” he explains. Birds have also been shown to change their songs in response to noise, by raising the volume or pitch or changing the frequency. Such shifts, says Francis, can help animals be heard. But they “could also have unintended consequences for that individual,” he says. “We know from frogs and lots of other species of vertebrates that the pitch at which an animal vocalizes is often an indicator of body size” — the lower the pitch, the larger the individual, Francis notes. Males pushed to sing at a higher pitch could be perceived by females to be less desirable mates. That in turn could reduce those males’ mating success, altering that particular population over time. Some birds living close to noisy roadways have also been observed to have fewer eggs and less healthy young. A study led by Hansjoerg Kunc, lecturer in biological sciences at Queen’s University Belfast, showed that the complexity of birds’ songs also appears to be sensitive to noise. In an experiment with European robins, “with increasing noise levels, the complexity of song level went down,” Kunc says. “Even if I’m a good male, in a noisy environment, I might be forced to decrease my song complexity to get its message across.” The comparison with what happens to human conversation in a noisy bar or restaurant is easy to make. Noise can also disrupt cues between parents and their young. In experiments with tree swallows, Andy Horn, research adjunct at Dalhousie University, has seen nestlings’ feeding routines upsetby low levels of white noise. “The nestling’s job is pretty simple. It has to eat and has to keep from being eaten. To do that, it’s pretty reliant on sound,” he explains. Nestlings exposed to noise are less likely to pick up on sounds that would signal a parent’s arrival with food — or the arrival of a predator, such as a raccoon. This suggests that, disrupted by noise in the wild, nestlings might fail to catch auditory cues indicating they should beg to get fed or crouch down to avoid danger. Although they might be the most obvious indicators of the impacts of humans on the natural world’s soundscape, birds are far from the only animals affected by anthropogenic noise. As scientists are discovering, the acoustic environment plays a vital role in well-being even for animals we may not think of as obvious vocal communicators. In addition to disrupting behavior, human noise can act as a chronic stressor that sets in motion physiological changes that harm health. And sound can take a toll on an animal’s energy reserves if it means burning fuel to avoid or otherwise compensate for the noise’s impacts. Graeme Shannon, a lecturer in biological sciences at Bangor University in Wales, observed prairie dogs near Fort Collins, Colorado, that were confronted with experimental noise as well as noise from ongoing human activity, including oil and gas extraction. 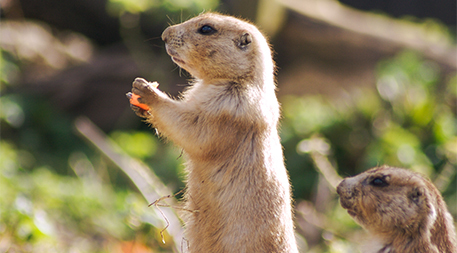 These prairie dogs foraged less and spent more time watching for danger. Some animals that aren’t obviously social communicators appear to respond to anthropogenic noise. Kunc recently reported that squidlike marine animals known as cuttlefish changed their visual displays when exposed to anthropogenic noise. Even plants, research by Francis and colleagues suggests, can be affected by changes in the acoustic environment through what biologists and ecologists call a cascade effect. While observing hummingbirds in New Mexico, they noticed that when noise upset the birds’ usual patterns of seed dispersal and pollination, this in turn affected where and when seeds were available for local mice — and, ultimately, where new seedlings might sprout. Whales and other marine mammals that use sound to communicate are arguably the animals whose acoustic environment has received some of the most scientific scrutiny. It’s been known for many years that noise from ships, sonar and industrial activity can disrupt vital communication between whales and physically damage their hearing. If severely disoriented by noise, whales can even become stranded and die. “What a lot of people don’t realize is that the oceans are a very noisy place,” says National Oceanic and Atmospheric Administration spokesperson Connie Barclay. And today they’re noisier than ever. According to scientists at the Scripps Whale Acoustic Lab, the background levels of anthropogenic ocean noise have doubled every decade over the past 60 years — from commercial ship traffic, underwater oil and gas extraction, and other industrial or military activity. “We’re essentially scouring the ocean of [natural] ambient sound,” Shannon explains. “We understand more about noise than we did in the late 1990s,” says NOAA Fisheries’ acoustics expert Amy Scholik-Schlomer. Among other things, scientists have learned that levels of noise affect different species in distinct ways. “This helps us better assess different noises’ impacts on different species,” explains Scholik-Schlomer. For example, research by Chris Clark, senior scientist withCornell University’s Bioacoustics Research Program, has shown that anthropogenic noise has reduced right whales’ habitat in Cape Cod Bay by as much as 80 percent. The noise disrupts the whales’ ability to communicate with each other about their habitat, which helps them navigate and find food. “Sight underwater is only possible up to about 30 feet, but it’s possible to communicate for miles,” says Shannon. When a species is also under stress from other environmental impacts — as whales are from ship strikes and fishing gear entanglement — disruptions to their acoustic environment can take a significant toll.Noise has prompted whales to abandon feeding grounds. And as Shannon notes, when a species is also under stress from other environmental impacts — as whales are from ship strikes and fishing gear entanglement — disruptions to their acoustic environment can take a significant toll. NOAA is now using what’s been learned about how different marine mammals respond to sound in its new proposed guidelines aimed at protecting their acoustic environment. “In the past,” says Scholik-Schlomer, NOAA “treated all marine mammals the same, mostly because we didn’t have a lot of information.” Now, she explains, “we’ve set different levels of noise that we’re concerned about [for different species] that can cause harm to inner ears or behavioral harassment” — in other words, noise levels that can outright harm marine mammals’ ears or that cause damaging changes in their behavior. Shannon and other scientists studying impacts of noise on wildlife say it is possible to reduce the noise of tires on roads by changing materials used in ways that would reduce friction. Perhaps more simply, barriers can be constructed, including with vegetation to block road noise. But such barriers, wildlife biologists caution, must be carefully considered so as not to create other obstacles or intrusions that would degrade wildlife habitat. While the technology has not yet been tried out with wildlife,Steven Cummer and colleagues at Duke University are experimenting with something called “acoustic cloaking.” Working with what are called “meta-materials,” they’ve created structures that hide objects and divert sound waves in ways that make both the object and the “cloak” virtually disappear. The engineers say one possible application is sonar avoidance. 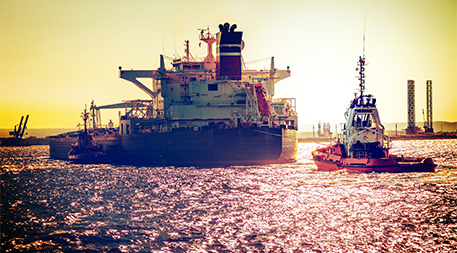 When it comes to major industrial activities, such as oil and gas extraction, muffling noises can be technically complex and expensive. Yet some such recommendations have been made in North Dakota, specifically to protect wildlife. Meanwhile, while more remains to be done to protect the ocean’s acoustic environment, Shannon points out, much has already been done on both the U.S. Atlantic and Pacific coasts with relatively simple measures like slowing ships. Research now underway across North America is working to pinpoint how noise affects individual animal species and what happens when that noise is eliminated, Fristrup says. This information will help develop what scientists hope will be “meaningful mitigation measures” — ways of quieting the noise that is increasingly being recognized as a key element of habitat degradation. The good news is that the acoustic environment can be restored with no lingering impacts, says Fristrup. Learning more about exactly how noise affects wildlife – and how changing existing noisy environments by removing that noise – is rapidly becoming essential to wildlife conservation and improving animals’ prospects in an increasingly challenging world.